Last fall I had the good fortune to attend a regional workshop and conference on post-secondary teaching and learning, or as it now increasingly called: the scholarship of teaching and learning in higher education (STLHE). 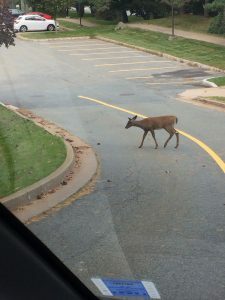 For me, the highlight of my weekend was watching a fawn walk in front of my car — seemingly without a care in the world – as I left Mount Saint Vincent University for lunch and some reflection. However, James Lang, the keynote speaker, was a close second. His talk was organized around a series of suggestions that were intended to make for more effective university-level teaching. His thinking was empirically grounded and focused on steps that could be taken with a minimum of fuss. It was also mercifully free of the buzzwords (like “learning styles”) that, to my mind, have done more to muddy the waters in discussions about university-level teaching than anything else. The rest of the conference was good too. It was lively, participants were enthusiastic and generous, and the sense of common mission – taking steps to improve university-level teaching – was palpable. I left wanting more. Perhaps, the fawn was a good omen. The good omen fawn. Photograph by author. Later, as I drove home, I began to think about who had attended the conference. A broad range of disciplines were represented: literary critics, biologists, mathematicians, chemists, business professionals, kinesiologists, and a long list of others. Cognitive scientists and teaching centre staff were over represented, but as I thought about, that made sense. This was their gig. What struck me, as I thought about it, was that there were few historians in the room, at least in the sessions I attended. Why was this? It is not, as sessions at the CHA, this series of blog posts, or even Active History itself illustrate, that historians are uninterested in the university classroom. Quite the opposite In fact, the debate that has periodically polarized this generation of historians is over what is being taught and what is being learnt. Moreover, as Daniel Ross’s recent post illustrates, historians have not been slow to adopt new techniques, materials, ideals, and media to the university history classroom. Said differently, the historical discipline is not populated with fuzzy old recalcitrant educators being pulled against their will into the future of teaching and learning. Perhaps, it is precisely the regular ongoing engagement with teaching and learning that is part of the historical discipline that explains why historians have, in Canada at least, not been key contributors to the scholarship of teaching and learning. In their own discipline, historians are addressing issues of teaching and learning all the time. Yet, the distinction remained. Even historians and history educators don’t seem to run in the same circles. Few academic historians, for instance, (and mea culpa!) seem to attend the Historical Thinking Summer Institutes. What I’d like to do in this two-part blog is to argue that the scholarship of teaching and learning has something to offer historians as university-level instructors and, equally importantly, something to which historians can and should contribute. The STLHE will not revolutionize the university-level teaching of history. Our students will not all suddenly start producing A-level work. But, as James Lang suggests, it can contribute a series of small changes that enhance what we do in the classroom. In the next blog post I’ll suggest three of these small changes. In this post I’d like to focus a bit more about what the STLHE is and provide some resources, that I hope will be useful. I’ll also try to suggest how historians can and should contribute to the broader conversation of STLHE. I am not an expert on the STLHE, but from what I can tell it is more than a bit of a broad grab bag. On its highest level it represents an effort to bring greater intentionality, evidence-based practice, and professionalism to teaching and learning. Put differently, the STLHE logics like this: we have a bunch of research from educators, cognitive psychologists, and others that clearly relates to post-secondary education. Why don’t we make use of this research? If we have studies that point to more effective ways to organize class time or more effective study habits or better testing strategies (better in the sense of contributing to learning objectives), why neglect these? This is the type of STLHE that interests me: what can I do, as an instructor, to improve my students educational experience and performance. What strategies can I use to help students learn more? However, this is not all there is to the STLHE. The STLHE addresses a broad range of topics, from teaching specific concepts to student motivations to problem-centered learning, among others. In short, the STLHE is an interdisciplinary field but one which simultaneously bears specific focus. Professional writing in the STLHE is affected by the disciplines that make the most sustained contributions. The role of professional educators and cognitive psychology, for example, is evident from even a quick review of its leading periodicals and that was my experience, too. Participants in the sessions I attended came from a variety of disciplines, but folks who taught skill-oriented courses (communications, reading, remedial science or math), along with staff from teaching centres, seemed over-represented. Said differently, much of the discussion was valuable but also needed to modified for the university-level history classroom. In my view, this is a bit of a shame because, I think, historians have something to offer to the STLHE ,and they have, I might be so bold as to say, been offering it for some time, just in another guise. The STLHE is not about separating good instructors from bad ones. Indeed, to attempt to make it about some sort of ranking of instructors or their techniques does a deep disservice to its goals. Let me be clear about this: the STLHE does not provide supporting scholarship that can be used to, say, justify denying tenure to anyone on the basis of poor teaching. It is about providing means through which post-secondary instructors can make their own work more effective. Here, historians teaching in universities could make two contributions. First, we bring an historical perspective to the subject. The fact that the evidence suggests that certain classroom strategies or tactics can work better than others needs to be placed in a temporal perspective. Historians have seen, researched, and written about, the history of educational reform. Historians have written extensively about the changing roles and dynamics of higher education. Conceptions of effective teaching relate to their context and depends on how one thinks about other social objectives. What supposedly new ideas are actually not all that new? Where did seemingly new educational ideas come from? How are they connected to cultural, gender, political, and economic processes? In this regards, James Cairns’ fascinating new book, The Myth of the Age of Entitlement, provides important context when it comes to looking squarely at neoliberal post-secondary policies and their effects on higher education and its goals. In showing how changes to teaching can be linked to broader historical processes – in ways that both challenge and reaffirm neoliberalism – historians can contribute a different kind of voice to the STLHE. Second, and again like Daniel Ross’s piece suggests, historians can contribute case studies to the literature. One might hope, in fact, that this series will stimulate more case study contributions. What have we tried that has worked? What has not? How have we measured that work? What excites our students? What does not? What skills are we trying to built in the classroom? What habits of mind do we seek to promote? What ethics do we strive to inculcate? How do we encourage students to think about issues from a temporal perspective the includes a range of contributing causal factors? How could we historicize our own context? The need to address racialized and racializing dynamics of colonialism, for instance, and to respond to the Truth and Reconciliation Commission recommendations might serve as cases in point. Both orders of contributions I think historians can make to the STLHE involve a different set of educational objectives for higher education than were overtly being addressed even a few years ago. They involve different educational strategies, different voices, and different perspectives. This is something that is, from what I can tell, not on the agenda of the STLHE and it would be an important contribution of historians were to put it there. Historians are used to discussions about post-secondary education. This series provides us with a chance to draw the university history classroom more directly to the forefront of our discussion. It provides an opportunity to forge a renewed conversation about post-secondary teaching and learning. In the process, I think, historians can and should do so in connection with the STLHE. Historians can learn from it and, equally importantly, make a contribution to it. Andrew Nurse is a professor in the Canadian Studies program at Mount Allison University and a contributing editor at ActiveHistory.ca. James M. Lang’s blog, Reflections on higher education, literature, travel, and more. Regrettably, our discipline (the Canadian version of it, at least) is one of the most, if not the most, conservative I have ever come across in more than 15 years of interacting with STLHE and the complementary Educational Developers’ Caucus. True, the last five years have been fantastic in terms of commitment to pedagogical discussions and change among Canadian historians, but we are at least a full generation behind relative to other disciplines, not to mention our significantly more progressive American historian colleagues. It’s hard to even hypothesize as to why Canada’s historians have taken so long to realize the value of pedagogical research relative to colleagues in other disciplines without having a more comprehensive understanding of those disciplines’ cultures. That said, I would suggest that one of the big challenges facing our discipline is that, historically, we have (at the collective level) been good enough educators (part a credit to us, part because history – with its stories and chronologies – is a discipline that invites good teaching) that there has never been the kind of call for massive change that faculties of engineering, for example, have faced. Perhaps the significant decline in history majors is changing / will change that, but I can’t fathom the idea of hoping for a crisis. It seems to me that we won’t really turn the page until we admit that, based on the research, the entire system of having history professors do the lecturing and having significantly less trained teaching assistants do both some of the seminar facilitation and written assessment is fundamentally backwards. Students “learn” the most, in other words they retain the most, from individual attention and personalized feedback, not through the performance element of the lecture. I happen to be a proponent of the lecture, in that it can provide context and create an excitement for learning that can carry over into smaller classes and inspire creativity, but I can’t recall the last time I heard anyone versed in the teaching and learning literature suggest that students retain very much of the specific content in the long term. They do, however, retain ideas that they discuss in seminar, and they certainly improve their writing based on instructor feedback. It follows that we should be putting our best qualified people in the seminar room and we should be having them read and respond to drafts of essays. Any lecturing they can do should be a bonus. Instead, we often lecture almost exclusively and then allow less experienced graduate students do the work that is ultimately most likely to stick. Unfortunately, I don’t see such a paradigm shift coming any time soon. It’s ironic (or perhaps paradoxical) given the subjects of focus of an overwhelming number of Canadian historians, but the discipline is just too conservative to make such radical changes any time soon. Glad to see this post! Lots of ideas for discussion. Historians in Canada – including myself – have been involved in History Education and SoTL (the Scholarship of Teaching and Learning) for a long time. The History Education series, with Samantha Cutrara as editor, is a great example of this. So is the work of scholars including Ruth Sandwell. I have a somewhat unique perspective as I have a Ph.D. in history, a B.Ed. (with specialization in teaching history), and have been teaching high school and undergraduate history for the last twenty years (as well as teaching in a faculty of education – creating and delivering courses to help current history teachers upgrade their qualifications). There are certainly some excellent university history professors. They have a natural talent for making material interesting and accessible. They take time to assess student work fairly and effectively, and they provide good feedback (and help when required). However, it is also well known that being a good teacher doesn’t get you far in university. 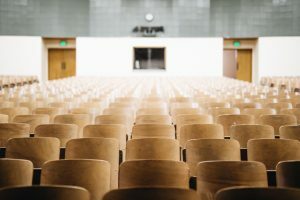 There have been a number of books published (one that came out some time ago was called No Place to Learn) that outline how publications and grants are what make a university career, not pedagogical ability. I would believe teaching was valued if history departments began to provide professional development courses for their faculty and teaching assistants (mandatory in the case of the latter) in areas such as assessment, differentiated learning, accommodations, and Peter Sexias’ work on historical thinking (and how that can be practically and effectively done in a classroom regardless of class size). There is hope at some universities with the development of the “teaching stream” professors. This has the potential to reach students who struggle in their first year or two of university, and to help them develop the skills to be successful in their degrees. I would like to disagree with one element of the article. Andrew refers to the use of “buzz words” such as “learning styles.” Education is awash with buzz words, and I share his pain; however, the concept of learning styles has been around since the 1980s and doesn’t really qualify as a buzz-word any longer. It is an established part of instruction in faculties of education. Thanks for these comments. I’ve read some of Cutrara’s work and loved it. Sometime, I might speculate more on the reasons why historians have not been as engaged in the STLHE as some other disciplines but I’d re-assert my points: (1) I think historians are interested in education and so big thanks to Andrea and Krista for putting this series together, (2) I think historians have a lot to contribute. There is a lot to learn, for sure, but it would be great to see some back and forth and I think these comments are a great start. Thanks for this post Andrew. It is exciting to see many historians in Canada focus more on teaching, learning, and assessment. I was both encouraged and discouraged by the Historians Teaching History pre-Congress conference hosted at Mount Royal University two years ago. Encouraged that many historians are thinking more about teaching history, but discouraged by the lack of awareness many historians have of more than forty years of history education research, including a robust and active community of scholars in Canada. Many of the issues, questions and concerns historians raised at the conference had been thoroughly discussed, analyzed, and researched by history educators. SOTL (Scholarship of Teaching and Learning) has much to offer historians in terms of generic teaching and assessment strategies and methods, but I would suggest that educational research focused on discipline-specific teaching, learning, and assessment in history is essential reading for all graduate students in history. AHA President James Grossman has suggested that any graduate history degree that does not include a focus on teaching and learning history is not adequately preparing students for the post-degree world, which for the vast majority of students will include teaching history. As Sam Wineburg’s latest research has illustrated, undergraduate history programs make numerous claims that studying history will improve students’ historical and critical thinking abilities, and yet his small study indicated that this was not the case for 3rd and 4th year students in the historical thinking assessments they were given. If history departments are going to claim that studying history will improve students’ ability to think, it is crucial that professors can articulate what it means to think historically and critically, and highlight how their teaching and assessments strengthens these abilities. I have a lot more to say about this, but perhaps I will save it for a few AH posts. Learning styles is an important part of the curriculum in Ontario (crossing multiple academic subjects and grade levels). It is an important component of differentiated instruction. “Growing Success,” the Ontario Ministry of Education’s policy document on teaching and assessment, notes that teachers in Ontario need to create lessons and units that “relate to the curriculum expectations and learning goals [of the curriculum] and, as much as possible, to the interests, learning styles and preferences, needs, and experiences of all students.” Student teachers I’ve had from OISE and York University are still taught learning styles as part of their teacher training. There are other ministry documents that outline the importance of learning styles as well as educational research, but I don’t think a bibliography is needed in a comments section. I’d also note, anecdotally, that I have some students who would like nothing better than to listen to a good lecture. Others prefer to read. Some need an activity to drive them (such as a class debate). Some do best in group work. Some do best when they work alone. Some students can taken in verbal instructions and understand what is required of an assignment or assessment while others need visuals (and at times exemplars) to get a grasp of what is required. some students need graphic organizers and other students don’t. Some students can demonstrate their learning best through writing, others through discussion. From what I’ve seen, learning styles fits the students I’ve encountered over the last 25 years. To bring this all back to the original article, my guess is most university history faculty don’t talk at such length about pedagogy and assessment. Hi all, thanks for the comments on this post and my apologies for not getting back to it sooner. I’d argue that “learning styles” was one of those things that (a) might have something going for it, but (b) many institutions — including my own — waded into without really looking at the research. Thus, it became a buzzword here that was used for all sort of things that were not really advancing education. Knowing one’s strengths and weaknesses is useful but also understanding that any learning often involves a range of techniques and strategies and drawing those to the forefront and, for students, taking some confidence from doing them, is a good things. Thanks for the comments. I have seen very little educational research literature that supports the notion that learning styles exist and should be nurtured. You frame this as a debate that is ongoing, but that is not my understanding at all, as my reading indicates learning styles has been thoroughly discounted, not just be neuroscientists, but also cognitive psychologists, etc… You’re right that criticism in itself doesn’t mean a theory doesn’t hold water, but it seems that for a theory to hold, it must respond to the criticism, which I have not seen. Perhaps you can email me some of these articles? It seems to me that you have confused differentiated instruction, learning styles, and students’ preferred modes of learning. What students “think” their preferred learning style is, does not mean this is their preferred learning style, or that their learning will improve if this style is utilized. I don’t want to use the Active History comment boards to continue our discussion re: learning styles. Perhaps you can email me the bibliography that you were talking about at lgibson@ualberta.ca ?